Turn off the TV and start moving! We all come in different shapes and sizes, and it doesn’t matter if you’re tall, short, skinny, or round. Your body is your own, and you need to take care of it. This book is guaranteed to inspire you to get off the couch. Vibrant, fun-filled illustrations and an encouraging text explain the many great reasons to exercise, from making new friends to going new places, or just keeping your body in shape. 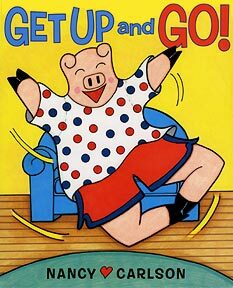 Nancy Carlson’s gleeful story and vibrant illustrations are sure to make readers young and old get up and go exercise!